Brasilia-Chandigarh: Living With Modernity is an enchanting book about the daily city life of these two great Twentieth Century capitals. Both cities share common architectural attributes, stemming from their common early-Modernism DNA: the plasticity of concrete, the deep thinking about how to assemble the various aspects city, the ambition (and realization) of building an ideal city in the face of the impossibility of the task. Each spread is a single photograph, and each spread is a world of lives unto itself. The first half is devoted to Brasilia, the second Chandigarh. Iwan Baan captures the city through his watchful camera, and his technique of having people engage (or try to ignore) his camera is a brilliant one: it connects the reader of this book to the city life he is documenting. Even then, only around ten years after the construction, the tropics had done their work, and human beings had inserted themselves between the design and the practice. To be clear, perhaps you could put it this way: architectural sketches are always silent, whereas cities never are. It is not drawings that live in cities, but people, unpredictable individuals who might at any moment disturb the order that has been designed for them, who may break through the silence of the sketches by making use of that unique instrument that makes a city a city: the human voice. Having visited one of these cities this year, I found myself transported back to Brazil. 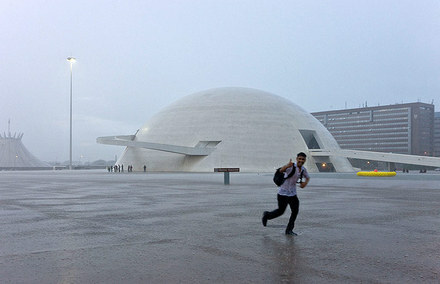 Brasilia is beautiful, shining, and entirely unexpected. In the areas I wanted it to be great, it was not. Yet it was great in areas I did not expect, or did not even know to expect: because so much of it is unlike any city anywhere, it felt continually new, without feeling oppressive or alienating. Iwan Baan's photographs are like that feeling. They are inviting, unexpected, and evergreen. Please support Tropolism by purchasing this book at Amazon.